When I went to turn in for the night in my room there was a very beautiful comfortable bed. It was very ornate and beautiful, and there was even an air conditioner! Naturally I thought this was Jaya and Sujathas bed, but the truth was, they had borrowed the bed and the air conditioner for my comfort. Jaya and Sujatha had never slept in a bed in their life. Well, I did not want them sleeping on a single cot, especially with Sujatha in her third month of pregnancy. I enquired the cost of the bed, a mere $150 and worth every penny and I told them, when I am not here you can sleep in my bed! I brought home the straw woven rug they used to sleep on which decorates my living room floor and is a constant reminder of how Blessed we really are. The next morning Sujatha was right there with coffee, which is made with buffalo milk and some powder that more or less resembles cappuccino. She prepared some eggs and breads for me to eat. There was a service to honor me at 10am that morning. 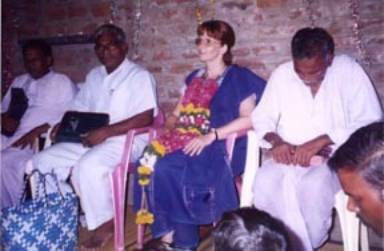 At first Shulamitti (their youngest daughter at the time) kept her distance from this red-haired white-faced woman, but in days to come she became my shadow and I grew to love her as my own. I sat up front in the company of such seasoned men of God. I was honored to be counted as one of them. Later, three of the men seated there would take part in my ordination as Reverend. I was adorned in flowers and there was a special celebration ceremony. The man to my right with his head bowed is Pastor Isaac from the village of Emani. It was such a beautiful, highly spiritual service, because the spirit of the Lord was always with me. Often I would awake around 3am and there would be an awesome communion with the Lord that would strengthen me and also give me what I would preach on the next day. I had no experience as a preacher, but I knew whom God calls, He also equips. Jaya and I gave our sermons together. We would study the message we wanted to present, and I would speak and he would translate, except when I sang!